Home » Travel Deals » Can solo travelers avoid the single supplement? Can solo travelers avoid the single supplement? One of the easiest ways to plan and book a vacation without spending much time on it is to book a cruise or a vacation package. Both offer exceptional bargains and they allow you to book everything with one click – no hunting around for each element of your trip. Plus, you know you’ll be well taken care of for the entire time you’re at the resort or on board the ship. The trouble with cruises and vacation packages is that they’re designed for people traveling in pairs or groups. As any solo traveler knows, the dreaded words “single supplement” often mean the difference between a cruise being a super discounted trip or being just a so-so deal. Although traveling solo does mean that you have to be on the lookout for hidden fees cruise and tour companies charge single travelers, being on your own doesn’t mean you have to avoid cruises and package trips altogether. Yes, you have to pay attention a bit more, but you don’t have to pay the single supplement. Among the many tips to avoid the single supplement, the easiest one is to travel with a friend. That may sound counter-productive to a solo traveler, but if your friend is also an independent traveler you’ll have a bunkmate to save money and still do your own thing during the day. Some companies will also set you up with an arranged roommate – another solo traveler hoping to avoid the single supplement – if you book the trip early enough. Other tips include seeking out “singles specials,” where companies offer certain dates of their trips for solo travelers, or patronizing cruise and tour companies that don’t charge a single supplement – or that have single-berth cabins so are clearly more prepared for solo travelers. 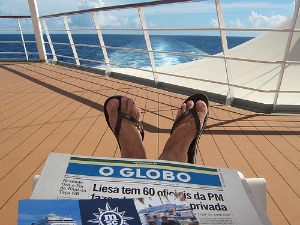 Read these and other cruising travel tips before you go, and have a great trip!